Come join us for the art safari of a lifetime! Join us for six unforgettable days of exploring, researching, sketching and painting the flamboyant tropical flowers of Rarotonga, in the South Pacific Ocean. The principle island in the Cook Island group, Rarotonga’s flowers bloom year round. We will be there to capture the exotic Bougainvilleas and Hibiscus and other exotic flowers. One of the highlights of last year’s trip to Rarotonga was a short kayak crossing of Muri Lagoon to the uninhabited islet of Motu Taakoka. We felt like real-life Survivors because we had this entire motu to ourselves. In fact, the TV show Survivor Cook Islands was filmed on the neighboring island of Aitutaki. I’m standing knee-deep in the bathtub-warm crystal clear water near the shoreline of Motu Taakoka. Just 20 feet to my right is a massive hibiscus tree, its flowered branches reaching out over the water. It was here that I found the beautiful yellow hibiscus that you see here, glowing in the afternoon sun. One of our workshop days will include a trek to Motu Taakoka where I will guide you to that same tree, and YOU can choose your own hibiscus to paint. This painting now hangs above our fireplace mantle. How would you like a painting like this that YOU painted, hanging above your fireplace mantle? You will find flowers like this in bloom everywhere as you travel around the island. Many of the flowers that I photographed were found not far from the front door of our room at the Edgewater Resort and Spa where we stayed. At first glance, many have commented that they thought my realistic paintings are photographs. Just last week I got an email from someone who said they loved my flower photographs. She was shocked when I responded to inform her that they were, in fact, paintings, not photographs. If you have the knowledge of how to “build” a realistic watercolor painting, creating images like this is well within your reach. But you have to know the procedure, and I will show you, using my simple step-by-step method. You will be amazed at how my easy-to-follow tips and techniques will improve the realistic quality of your paintings. Our mornings will be devoted to painting classes, our afternoons to excursions around the island. 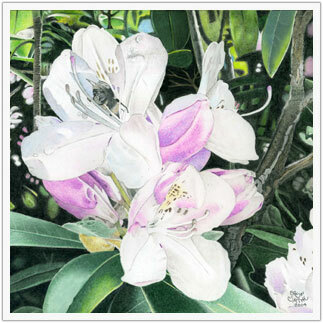 During the classes you will learn the techniques of drawing and painting realistic florals in watercolor. I will also show you how to subtly add other mediums to your watercolor painting to greatly enhance the dramatic effect. Advanced painters who may work in other mediums or subject matter are welcome to attend the workshop too. I think you will find watercolors to be a mobile and practical medium for overseas workshops. Many paintings begin with one or more pencil studies. 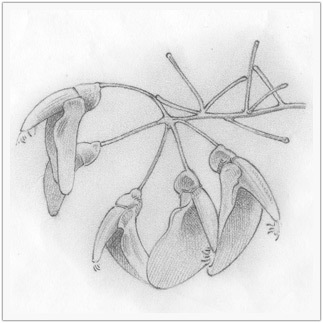 In one of our sessions we will explore the methods of rendering florals in graphite. You may want to do a value study like this one before you begin your painting. FYI: This is the only plant on the island that I was unable to identify. Does anyone know the name of this plant? One of the highlights of the last year’s trip was our afternoon at the exotic Maire Nui Botanical Gardens, set against the backdrop of the verdant jungle peaks on the south side of the island. An afternoon at Maire Nui Botanical Gardens will be at the top of our itinerary. We will dine among the blooming flowers at the garden cafe. 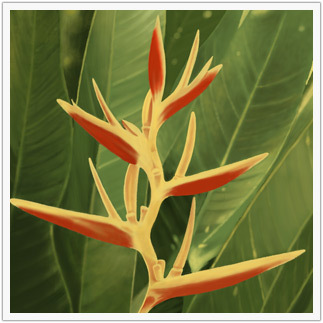 Much of the resource material for your future floral paintings will come from these lovely tropical gardens. 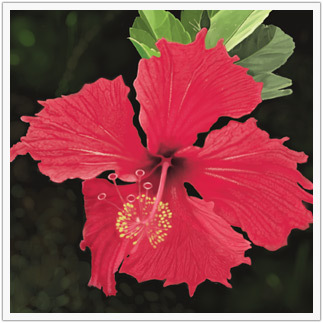 It was here, at Maire Nui, that I found the red hibiscus shown below. Our six days will pass quickly because they will be full of fun and exciting activities. Every day and evening last year on Rarotonga was packed with one memorable event after another. On one of the evenings we will take in an “Island Nights” buffet style feast and Polynesian dance celebration. It will be a night to remember…it certainly was for us last year. You will have the opportunity to try island dishes that you would probably never find elsewhere. It was at the Island Nights feast that I had my first taste of taro, the staple food on the island, comparable to our potatoes in the USA. The Polynesian dancers of Rarotonga are considered the best in the world. If you love swimming, you’ll LOVE the lagoon surrounding Rarotonga. Our day of snorkeling around Motu Taakoka was probably the most memorable day of our trip. After exploring, and photographing the flowers on the island, we waded all the way around the island. In places the water was up to our waist. Then we spent the next couple of hours with our mask, fins and snorkel exploring the coral reefs surrounding the motu. If you choose, you can bring a waterproof camera and photograph the neon-bright tropical fish as reference for under seascape paintings. We will go on a subject safari in Avarua, the island’s largest village, and the commercial center for the Cook Islands. 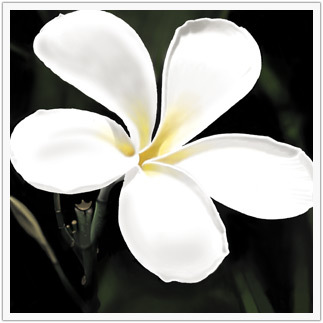 In Avarua we will search for Polynesian tapestries and native objects that will enhance your tropical floral still life painting. You will love Avarua. I found it to be the perfect idyllic island village…not too big, but not too little…and always with the backdrop of the beautiful volcanic peaks. We will be dining in Avarua as well. In addition to our discussions on painting the subtle value variations of the flower petals, I will also demonstrate how to realistically render leaves and backgrounds, as shown in my painting of the brightly colored bird of paradise below. You haven’t really seen the Cook Islands until you’ve seen Aitutaki. Many visitors to Rarotonga include this wonderful side trip…it’s only a 55-minute plane ride north of Raro. This fantasy island is considered by many travel experts to be one of the most spectacular places in the South Seas. It is often compared to the exotic beauty of Bora Bora. 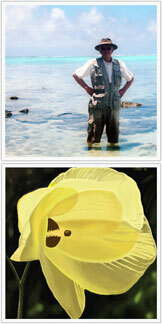 On Aitutaki you can explore, photograph, sketch and paint the flowers, motus, and sunsets of this idyllic island. Or you can just laze around and think of the wonderful week you just had on Rarotonga The boat trip on Aitutaki’s aqua-blue lagoon to the outer motus (islets) will leave you breathless with wonder. It’s one of the world’s largest and most spectacular lagoons. Bring your sketch pad and camera! If everyone signs on for the Aitutaki trip, perhaps we’ll all go together! The only reason that I didn’t include Aitutaki as part of the package is because I wanted the cost of the trip to be as affordable as possible. I’ve found that one of the greatest joys of the workshop is when our group has meals together. These were among the most memorable times on the island, meeting at different restaurants around the island for lunch or dinner. Before the first day was over our group had formed a bond. From then on we hung out together during the afternoons and evenings. It was great fun. Restaurants are abundant and diverse on Rarotonga. There are several to choose from in Avarua, and they are scattered around the island as well. You are never far away from a restaurant, and there are a surprising number of cuisines to choose from, including Chinese, Italian, Continental, Indian, Japanese, seafood, and local island dishes. Tropical fruits are a special delight on the island. This is your chance to drink coconut milk as fresh as it can get…right from the tree. Fresh ripe paw paw (papaya), mouth-watering mangoes, star fruit, juicy oranges and tangy limes, breadfruit, passion fruit, watermelon, guavas, bananas and pineapple. Enjoy these tropical delights while you’re on Rarotonga. You’ll love the pan seared fresh fish infused with lime juice, freshly caught lobster, ika mata marinated in coconut cream, curried octopus, sizzling steak with mango salad, pork and chicken with umukai, sweet potato, kumara, and of course, taro. Do you have a suggestion for a Painting in Paradise location? Bhutan…the Mongolian Steppes…Bali… Italy…France. If there’s enough interest, we’ll schedule a workshop at your suggested locale. Even if you’d like to schedule a workshop in your local area, let us know. We’re always open to suggestions.